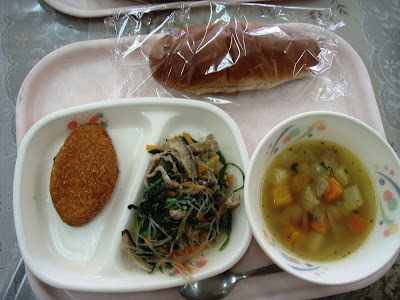 Contents: Bun, soup, fried fish, salad. Notes: Salad is a mix of spinach, shiitake mushrooms, pork, carrots and cellophane noodles, with a sesame flavored dressing. What it's called? I don't know the name of the salad but I eat it a lot for school lunch. It's a mix of spinach, shiitake mushrooms, pork, carrots and cellophane noodles. Probably with a sesame flavored dressing.